Jan checks for canker while Art holds. A little food is offered...and taken! 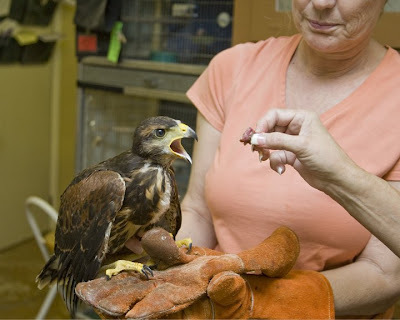 The little harris's hawk about which Megan spoke in her posting above came in and is altogether fairly healthy, if a little undernourished. Harris's usually hunt cooperatively in groups but it seems this particular group has been decimated by an introduced toxin, thus the little fellow left alive has no one to teach him the ropes, so to speak. He'll get a good foot up on life at Liberty and be released when conditions are safe and he has some help out in the wild. This doesn't taste like mom...! 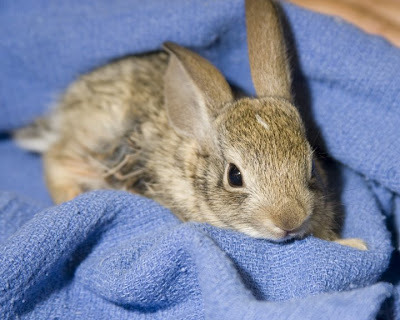 We've gotten in a few more baby bunnies recently. They all get an exam, fluids, and any emergency treatment they need before being transferred to Ruth Scott for more care and release. 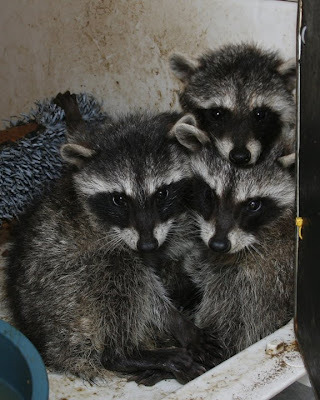 Three tiny baby raccoon orphans came through Liberty today. 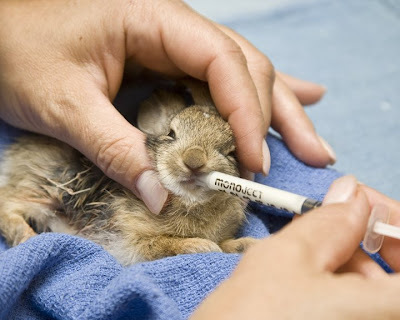 Like most mammals, they were sent off to Southwest Wildlife who have better facilities for mammals. 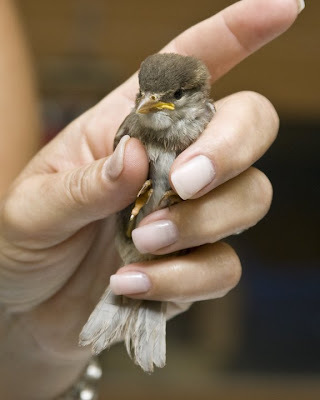 It might seem counter-intuitive, but mammals require more room to successfully rehabilitate than birds! 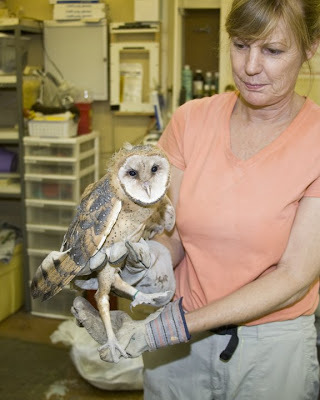 Louise holds a juvenile barn owl. 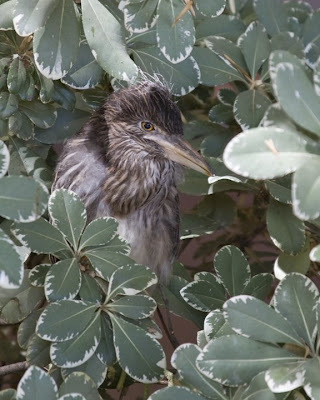 An almost-fledgling black-crowned night heron. 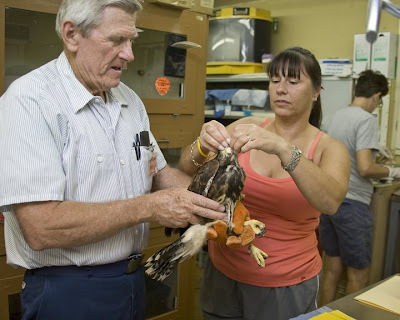 Yes, we still do birds at Liberty... From the tiniest of hummingbirds and sparrows through the larger raptors like barn owls and hawks, ALL get the same great care. Sometimes, that care means allowing the parents to do their job. 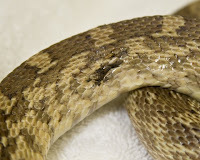 The little BCNH above was one of four from a nest in Scottsdale that was actually in a nice spot. Two were out of the nest and down low, two more were high up in the tree, all being watched by devoted parents. They will be monitored where they live and allowed to mature with the help of their own parents. Alright now, Uncle Terry is going to preach now. 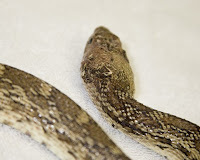 I always say that one of the reasons we only get a few reptiles in at Liberty is that when someone finds a snake, even a totally benign specie like a gopher snake, the first response is usually "Where's the shovel?!" Last week we saw that process at work. 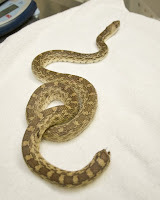 A little bull snake was brought in that somebody had beaten nearly to death with what was probably a garden tool. 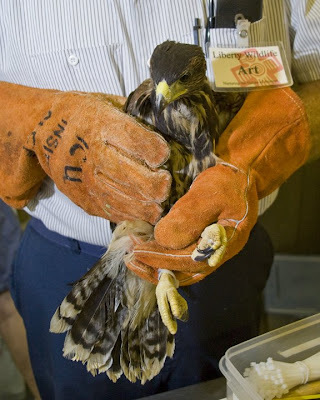 Folks,even if you think it's a dangerous animal, there's no reason to hack anything to death, especially when it turns out to be a harmless specie that only provides a service to us. I guess we need to increase our educational efforts on behalf of the reptile world. 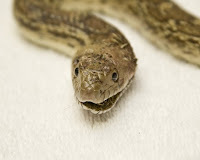 If you see a snake and you're afraid of them, call the Liberty hotline! David at the Great Wall of China. 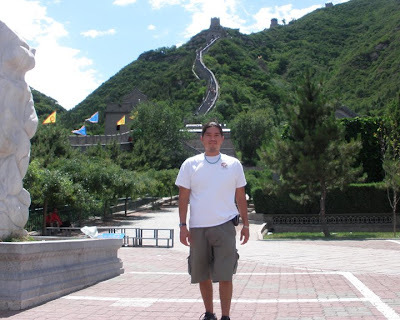 David Nezzie, friend of Amanda Williams, our Saturday Med Services lead is currently in China teaching english. 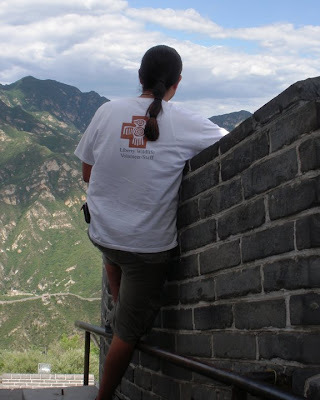 He recently went to the Great Wall and was photographed wearing the Liberty T-shirt! You rock, dude! Liberty knows no bounds!! Another effective and safe method to get rid of rodents is something called the Rat Zapper. It is more expensive than the snap traps ($40 on the internet) but it electrocutes the rodent quickly. Another much better alternative than introducing poison into the ecosystem!